This entry was posted in DigiLitSundays. Bookmark the permalink. 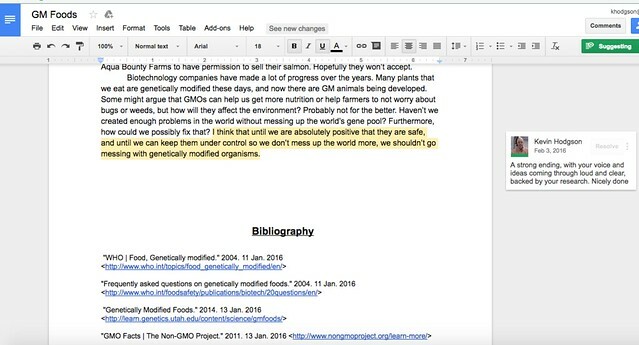 Kevin, while teaching a college summer institute, I used Google docs to comment on student work. It is such an easily accessible tool for providing a comment that will lead students to revision. Red pens are so outdated. Face to face conversations are ways to build personal, trusting relationships with writers. Thanks for jarring my memory to last summer’s experience. I agree with the hold back button on the comment section. If we overuse that easy access, we lose the conversation aspect of conferring. Kind of like texting when a phone call is better.